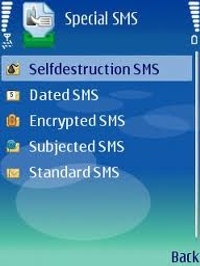 SMS Zipper free download for Symbian s60 3rd and 5th edition. SMSzipper for Symbian s60 compresses your SMS. Write SMS beyond 160 characters, send scheduled SMS, SMS with subject, selfdestructing SMS, and more - at no additional cost! The SMSzipper application uses an algorithm for compression of short text messages. While known algorithms and software for compression of text and data exists, these usually do not compress very short data or text blocks - the technology used for SMSzipper is optimized for short text messages. In addition, the compressor and de-compressor are using external coding models that may be created for specific languages, types of messages, or codes in text based messages or data. This allows the extension of use cases suitable for the SMSzipper technology. Variants The free edition of SMSzipper comes with an interesting range of features that allows you to send and receive compressed SMS, mark your messages with different labels, or even save your private messages password protected. In addition, special SMS allow never known features to be used with SMS.